Previously, the reasons for lost sales were stated only in a free-text format, making standardization and analysis of the root causes difficult. You can continue citing reasons in free-text format just like before. 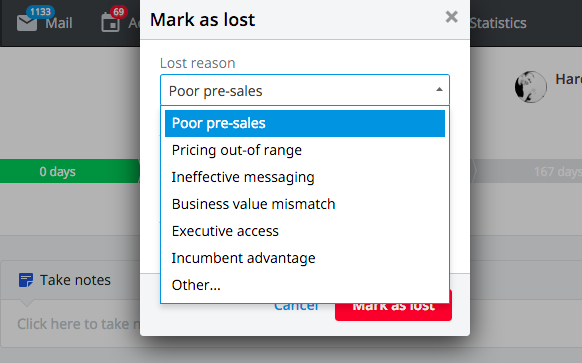 But using predefined Lost Reasons lets you standardize the documentation for the common causes behind losing deals. Meaningful insight allows you to take action to improve your salespeople’s performance. To start adding predefined reasons, head over to Company Settings. The best way for getting an overview of the most common reasons is to filter out lost deals in the List view, including Lost Reasons as one of the columns. Read this post by Timo Rein to find out why it’s necessary to define the reasons, and how it can help you improve your sales process.